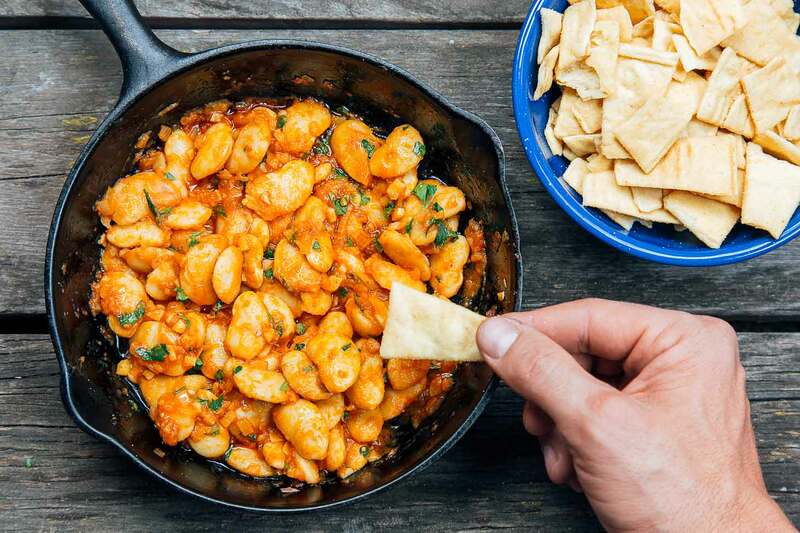 Pair this simple butter bean dip with a bag of pita chips or a loaf of crusty bread, and you’ve got the perfect campfire appetizer to hold everyone over until dinner. Before we started making this dip while camping, it was our go-to appetizer for house parties, potlucks, and BBQs. It’s a recipe we adapted from Serious Eats, and we love it because we can either make ahead or once we got there, serve it warm or cold (we prefer warm), and it always got us a ton of compliments from people – which, let’s be honest, is the easiest way for us to fall in love with a recipe. At some point, it became clear to us that this dip would be perfect for camping too. When we’re at a campground, one of our favorites times of the day is the late-afternoon happy hour. Camp chairs, cold drinks, and a setting sun – what could be better? But it’s nice to have something to munch on until one of us gets motivated enough to actually make dinner. Something filling, but not too filling. That’s where this butter bean dip comes in. As with a lot of appetizers, this one is great for groups. You can scale the amount up to whatever you want and just set it out for everyone to enjoy right in the skillet. We have a great 8-inch cast iron skillet that helps keeps the dip warm long after we take it off the burner. The active cooking time is less than 10 minutes, so you can get right back to relaxing. So whether you’re sick and tired of the usual store-bought dips or crave the attention and accolades that only a “from scratch” appetizer can provide, then give this butter bean dip a try. 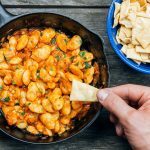 This appetizer is super simple to make on a camp stove or campfire while at camp, but it’s also one of those recipes that gets better if the flavors get to mingle for a while, so it’s a great candidate to make at home ahead of your trip and reheat on-site. Mince the shallot and garlic. 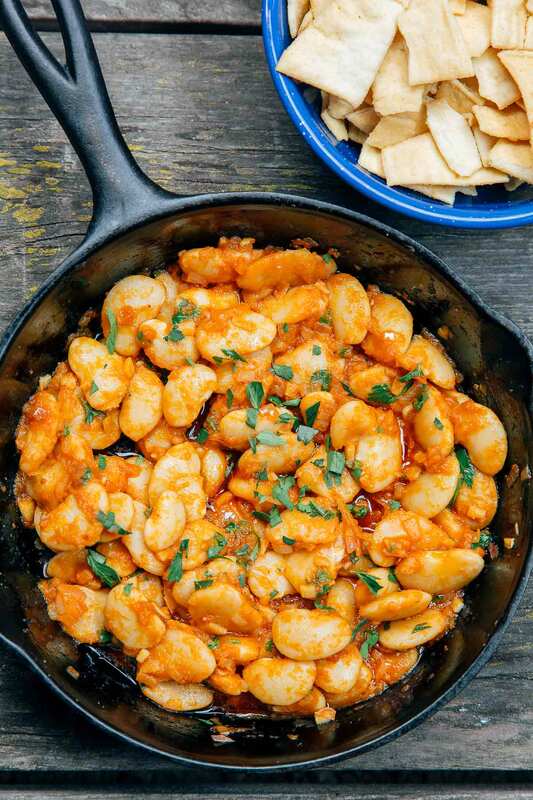 In a cold skillet, add the shallot, garlic, 2 tablespoons olive oil, and tomato paste. Saute over low heat for a few minutes, stirring often, until the oil gently bubbles. Add the paprika and stir. Add the drained beans, red wine vinegar, and 1/4 cup olive oil. Stir to coat the beans and cook for another minute or so to warm the beans. Remove from the heat, add salt to taste, and sprinkle with parsley. Serve with pita chips, crusty bread, or crackers. This recipe can easily be made at home ahead of your trip (it’s actually better when the flavors have time to mingle!). Store in a tightly sealed container in your cooler and reheat in a skillet over your stove or campfire before serving.